Hackbridge railway station is a railway station at Hackbridge in the London Borough of Sutton in South London. The station is served by Southern and Thameslink. It is in Travelcard Zone 4. There are also direct trains to/from London Bridge via Dulwich and Peckham Rye during weekday mornings and evenings. London Buses routes 151 and 127 serve the station. 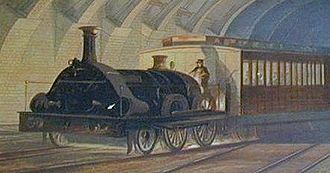 Wikimedia Commons has media related to Hackbridge railway station. 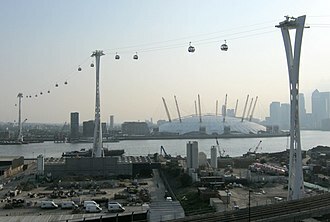 The Emirates Air Line is a cable car link across the River Thames in London, England built by Doppelmayr with sponsorship from the airline Emirates. 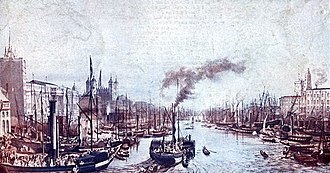 The service opened on 28 June 2012 and is operated by Transport for London, in addition to transport across the river, the service advertises a unique view of London. The duration of a single crossing is ten minutes, the cable car is based on monocable detachable gondola technology, a system which uses a single cable for both propulsion and support, used on the metrocable in Medellín, Colombia. The MDG system is cheaper and quicker to install than a more complex three-cable system which would allow larger-capacity cars. 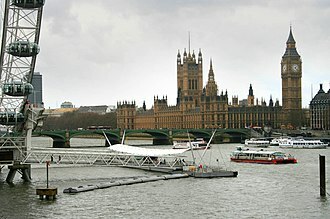 On 4 July 2010, Transport for London announced plans to develop a car crossing over the River Thames. It is the first urban cable car in the United Kingdom, designed by Wilkinson Eyre Architects, Expedition Engineering and Buro Happold, it crosses the river at a height up to 90 metres, higher than that of the nearby O2 Arena. The cable car provides a crossing every 15 seconds, with a capacity of 2,500 passengers per hour in each direction. Passengers can pay for their journeys with pay-as-you-go Oyster cards.1 metres above high water springs. South of the river there is a 60-metre main support tower, when the project was announced, TfLs initial budget was £25 million, they announced this would be entirely funded by private finance. TfL planned to make up the shortfall by paying for the out of the London Rail budget, applying for funding from the European Regional Development Fund. €9. 7m of ERDF support, out of an estimated €65. 56m total budget, was agreed on 9 July 2012 In January 2011, News International was planning to sponsor the project, but withdrew its offer. In October 2011 it was announced that the Dubai-based airline Emirates would provide £36 million in a 10-year sponsorship deal which included branding of the car service with the airlines name. Construction began in August 2011 with Mace as the lead contractor, Mace built the cable car for £45 million and was to operate it for the first three years for a further £5.5 million. Epsom railway station serves the town of Epsom in Surrey. It is located off Waterloo Road and is less than two minutes walk from the High Street and it is not in the London Oyster card zone unlike Epsom Downs or Tattenham Corner stations. The station building was replaced in 2012/2013 with a new building with apartments above the station. Services are operated by South West Trains and Southern, Trains serve Central London, Clapham Junction, West Croydon, Leatherhead, Dorking and Horsham. The railway first reached the town in 1847 when an extension of the London and this station was initially named Epsom, subsequently renamed Epsom Town. 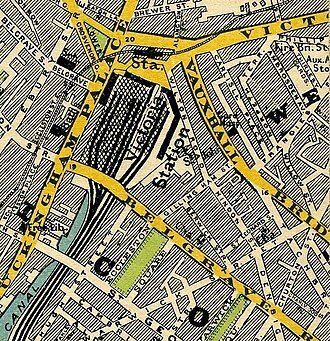 In 1859 a joint venture between the LBSCR and the London and South Western Railway extended the LSWR from Wimbledon to Epsom, where it joined with the LBSCR, the lines were connected south of the LBSCR station and a new Epsom station was established on the present site. 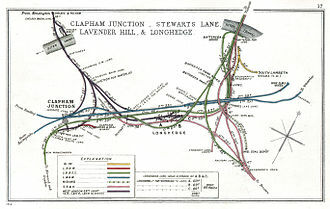 However competition between the companies remained and the new station was operated by the LSWR only, with the tracks configured so that LBSCR trains ran non-stop on the central tracks and these extensions provided greater connections for Epsom to much of the rest of Surrey. After the First World War, the companies were merged into the Southern Railway. The former LBSCR station Epsom Town was closed in 1929, when Thameslink services started in 1988 by British Rail its secondary southern route ran to Epsom via Elephant & Castle, West Croydon and Sutton, continuing to Guildford. 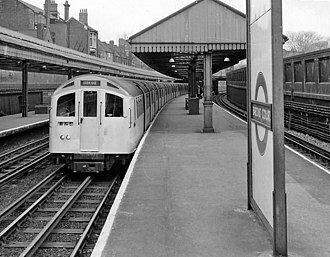 However the onset of rail privatisation made it difficult to maintain a line running across two other routes and services to Epsom were withdrawn in 1994. One of the proposals for the Thameslink 2000 project is to services from this station as part of a massive expansion of that network. For many years the southern ends of the platforms had a signal box above them. It was not listed, and despite extensive roof repairs it was demolished in March 1992, formerly there was a siding adjacent to platform 1 with a dock for the reception of race horses travelling by rail horse box. Had he touched this while in contact with the ground, he would have been fatally electrocuted, power had to be cut for approximately 15 minutes over a 3 miles stretch of track while Craswell was woken and taken to hospital. Hackbridge is a suburb in the London Borough of Sutton, south-west London, about two miles north east of the town of Sutton itself. It is 9 miles south-west of Charing Cross, the London Borough of Sutton is working to make Hackbridge the UKs first truly sustainable suburb. There has been a scheme in Hackbridge which has a number of developments on many sites. These are mentioned as part of the Hackbridge Regeneration, a key part of this is a £150m plan to redevelop the one million square foot former Felnex industrial estate, which has now gained redevelopment approval from the Greater London Authority. Work was expected to begin as soon as detailed consent was obtained for the first phase, Hackbridge has already achieved success in its green agenda in the form of the BedZED eco-friendly housing development, around 500 yards north of Hackbridge railway station. Designed to create zero carbon emissions, it was the first large scale community to do so, BedZED utilises a number of innovative technologies to enable it to operate with zero energy use. It has attracted wide interest over the past decade since it was built, key features of BedZED include, Zero energy—The project is designed to use only energy from renewable sources generated on site. There are 777 square metres of solar panels, high quality—The apartments are finished to a high standard to attract the urban professional. Energy efficient—The houses face south to take advantage of solar gain, are triple glazed, water efficient—Most rain water falling on the site is collected and reused. Location Hackbridge is located on the River Wandle in the London Borough of Sutton, the former Durand Close Council estate is being regenerated as a mixed tenure development by the Lavender Housing Partnership over the period 2003-2018. Churches The parish church of Hackbridge and Beddington Corner was built in 1931, burke-Downing, and it is located opposite BedZED on the London Road. Open Space Beddington Park, through which the River Wandle flows, is a quarter of a mile south of Hackbridge railway station and it is nearly 100 acres in size and is maintained by the London Borough of Sutton. View from the platforms looking north. The first Victoria line Night Tube service pulling into Pimlico Underground station. London Mayor Sadiq Khan and Managing Director of London Underground Mike Brown were on board. 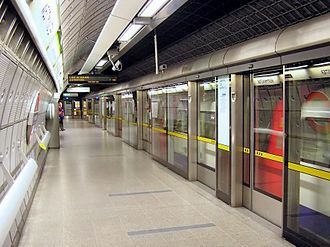 Closed platform screen doors at Westminster Underground station with a departing eastbound Jubilee line train.